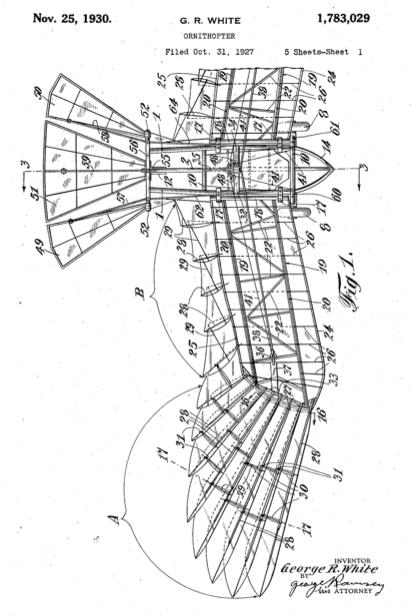 General note: Ornithopter: wing flapping, foot-propelled flying machine made by George R. White. Trial flights were conducted in St. Augustine. The ornithopter weighed 118 pounds, was 8 feet in length, and had a wing span of 29.5 feet. The frame was made of chrome molydernum covered with a non-inflammable transparent celluloid fabric. It crashed on test flight, but was later improved. Text above copied from a photograph of the ‘White Eagle’. I grew up around St. Augustine and never heard of this guy. You’d think with all the tourist attractions in “the oldest city”, there would be a museum or something. I’ve read about him before. Next time I’m down there I’ll try to find out more about him. The article linked above mentions some video. I spent some time searching for it, but no luck. It appears that not everything is up on the web yet. Viewing the actual footage could be very instructive.